Let’s get the full disclosure out of the way early: Rich Gott is a friend of mine, he was a professor of mine in grad school, and I’m acknowledged in his book. You could be forgiven for thinking that I’m incapable of being an impartial reviewer. I’m not. And yes, this will be a bit gushing. So sue me. 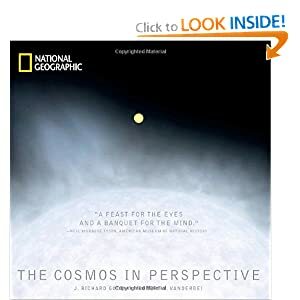 I got my copy of “Sizing up the Universe: The Cosmos in Perspective” in the mail today. Looking just at the title and the cover, you might think that it’s a simple atlas of pretty astronomical pictures (of much the type that you can easily find online through the Astronomy Picture of the Day), or a repetitive set of examples of “Powers of Ten.” It’s much more than that. Rich talks about how various map projections showcase certain features (a topic he and I explored a few years ago), and how geographic features on earth stack up to those elsewhere in the cosmos. It’s particularly striking to see the Grand Canyon put on the same scale as Mars. He discusses how the cosmic distance scale is established, and how you can estimate by rule of thumb. As a book for the layperson, it’s excellent, but what makes it more interesting to me is that there is plenty in there for experts as well, mostly because he just thinks about things in an incredibly unusual geometric way. The book addresses one of the biggest problem that I’ve seen when interacting with the public: scale. People tend to have a very tenuous grasp on how big things really are compared to one another. It doesn’t matter how many times you describe something as being so-and-so many pennies stacked on one another, or a million times this or that, you won’t get a visceral feel for how things relate to one another without the pictures. I particularly like the large centerfold version of Gott’s logarithmic map of the entire universe. I’ve had a black and white version hanging on my wall for years, but I think it’s particularly instructive because it’s not only a map, but a timeline. As you look further away, you look deeper into the past. Please do check this out. You won’t be disappointed. This entry was posted in Uncategorized and tagged astronomy, Books, reviews. Bookmark the permalink.